Episode 14: I'm Not Getting In That! Episode 16: Stop That Toad! Danger Mouse is a platform game, which was released by Zed Worldwide for mobile phones on April 25, 2011; it is based on the Cosgrove-Hall and Thames Television animated series of the same name and, like Danger Mouse: Quiz, released under the license from Fremantle International, who now own the rights for Cosgrove-Hall's Thames-era shows. 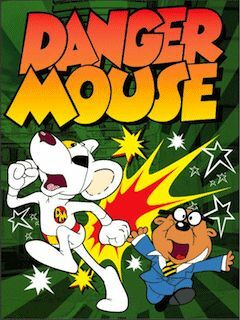 It is the fifth official title in the Danger Mouse series and the player must direct both Danger Mouse and his faithful assistant Penfold around sixteen levels (this is the first time Penfold is directly controllable in the series, as he followed behind Danger Mouse in the second part of the first game) to collect all the "DM" badges, and reach the exits, in the shortest possible times - and both characters must be switched between to solve various puzzles, but if one or both of them should get stuck the level will have to be restarted (however, the seventh level has to be done with Penfold alone, and most of the tenth one also needs to be done with Danger Mouse alone). This page was last edited on 15 January 2017, at 18:00.